The twins are only 4, but they have opinions. 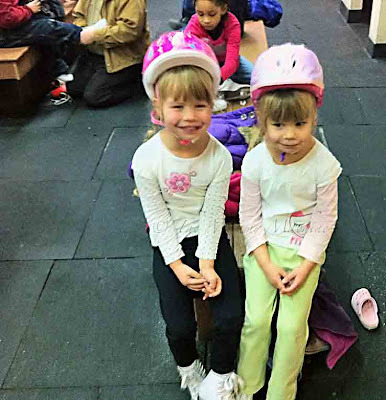 And one of their most strongly held is that they are capable of accomplishing anything that their older sisters do. Something as easy as skating is no exception. 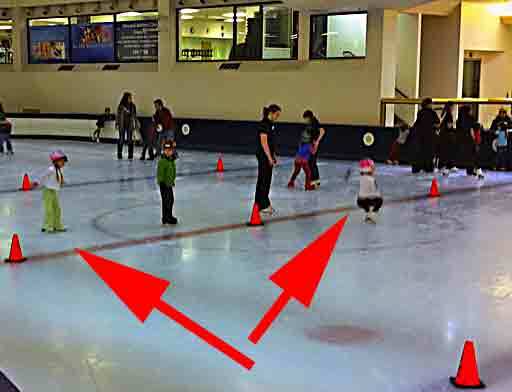 If their 10-year-old sister can spin on the ice, they should be able to. 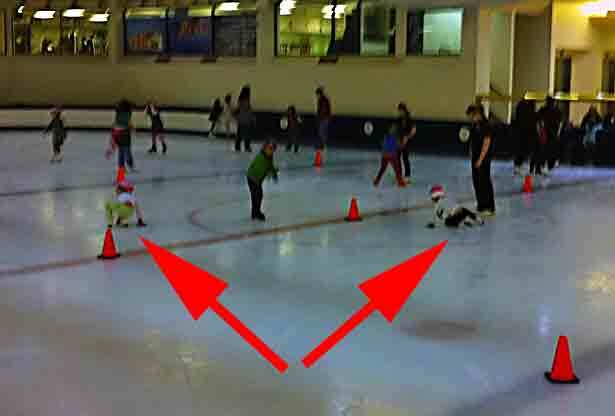 For Christmas, we bought them each a pair of used figure skates and signed them up for a beginner's lesson. I'm not sure which they were more excited about: the skates on their feet or the pink princess helmets on their heads. Before the teachers let the kids onto the ice, they show them how to stand after they fall. Ha! As if my precious angels would ever fall. They are superior athletes. Woops. Maybe only one of them is superior. Oh, dear. There goes the other one. Well, even coordinated superstars like my daughters make a mistake every now and then. This is embarrassing. Now they're both on their bums. Let's just skip over the next 4 or fifty falls, and . . .
TA DA! Both up at the SAME time! 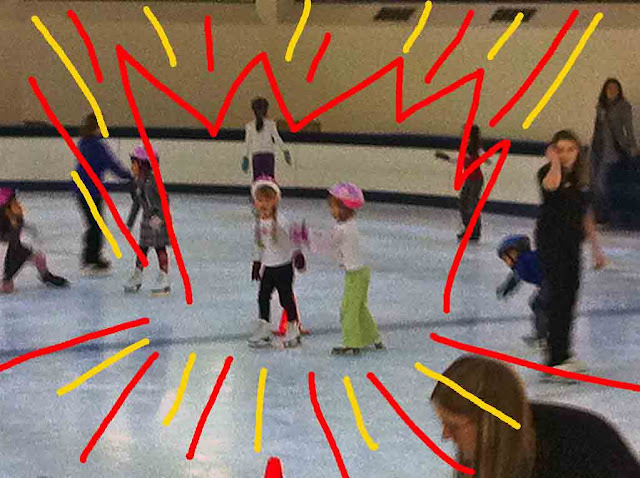 I don't mean to brag but I'm pretty sure my girls are future Olympic medalists. Gold and Silver medalists right there! SO cool! I always wanted to learn to figure skate so when I was in my 20s, I took lessons. 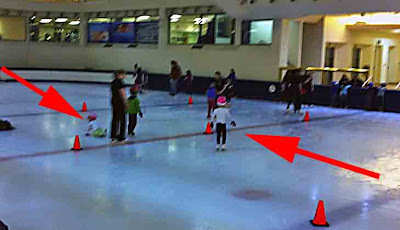 For a year I went...but there came a point when I'd learned all I could without getting a personal coach. (Plus, at that point, it was time to do some major jumping up and landing and I was terrified of that!) 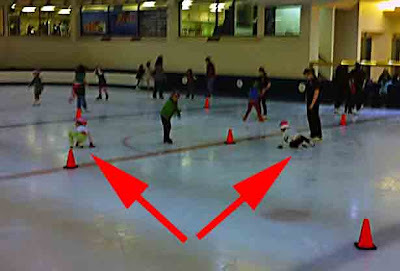 I didn't want to compete or anything, so I dropped off but at least I can skate backward now! Every year when I watch the Olympics, I want to be a figure skater when I grow up. But then I remember that I am all grown up and am stuck with this stupid doctoring thing. Which is good and all, but there aren't any costumes or chances to spin around. I'm glad that your daughters are living out my dreams! They're going to share the gold medal. For sure. 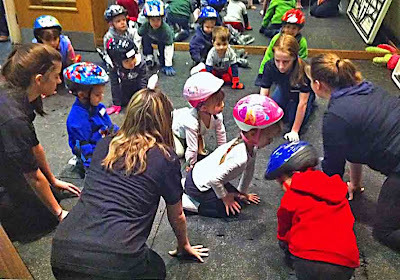 And they look so cute with those helmets on, too! So cute! You go girls!